3D printing is becoming a nuisance, though it does have certain practical uses, e.g. making medical devices. 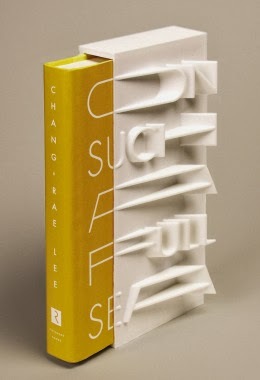 It can be used in art objects like the book jacket here, but it adds nothing but novelty to novel novel marketing(!) It cuts out the die-making step of mass plastic object manufacturing, and enables single object making, but aside from practical specialised uses, will likely be used mostly as a toy to make toys. We have too many useless plastic objects now and the large amount of energy required to operate the machine will be too often wasted. It just depresses me. I'm so sorry to hear your pessimistic view of this amazing new technology, Margaret! Let me attempt to change your mind a bit. Check out this HuffPo article from November: http://www.huffingtonpost.com/2013/11/15/3d-printer-inventions_n_4262091.html. It makes it pretty obvious that 3D printing has a lot of incredibly beneficial applications, like affordably printing custom prosthetics and replacement/support bones (if you know anyone who uses a prosthetic, you know just how ridiculously expensive they can be to make), printing custom-sized clothing (again, of particular use to people with body shapes or sizes which require expensive custom tailoring), stem cells, and 300-mpg cars! Yes, lots and lots of time and money will be spent printing novelties and toys, just like lots of time and money gets put into useless reality television (by both the producers and the consumers), so why not look forward to the positive effects 3D printing could have on health and the environment in a world already inundated with useless products? And what about novels, like On Such a Full Sea? Is not a novel a novelty?